1 – Rinse strawberries. 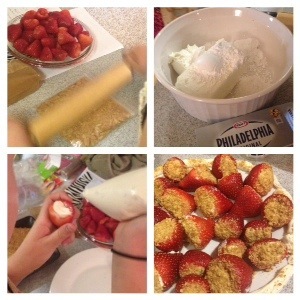 Remove top of strawberries and clean out center with a paring knife. Prep and set aside. 2 – In a mixing bowl beat cream cheese, powdered sugar, and vanilla until creamy. Add mixture to piping bag or Ziploc with corner snipped off. 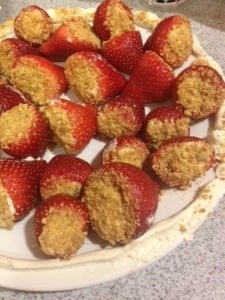 Fill strawberries with mixture then dip the top in graham cracker crumbs. Refrigerate until you serve.